Our Surf & Stay packages are the best way to experience New Zealand’s coolest surf town. Spend from 2 to 5 days learning to surf and enjoying the beach lifestyle. It’s a perfect way to start your surfing career and have a true Kiwi surf experience. After your arrival, let us do the rest so you can enjoy all the amazing activities that we have to offer. With a daily surf lesson and heaps of places to explore, the Raglan Surf & Stay packages are an awesome experience. Learn to surf with Mojosurf New Zealand! Located on the West Coast of the North Island, Raglan is the coolest surf and arts town in the country, and a world-class surfing destination. Our Surf & Stay packages are based in the awesome surf & arts town of Raglan on the West Coast of New Zealand's North Island. The perfect place to start your surfing career or build on what you have already learnt. Stay at Karioi Lodge, an eco surf retreat located by the famous surf spot, Whale Bay. 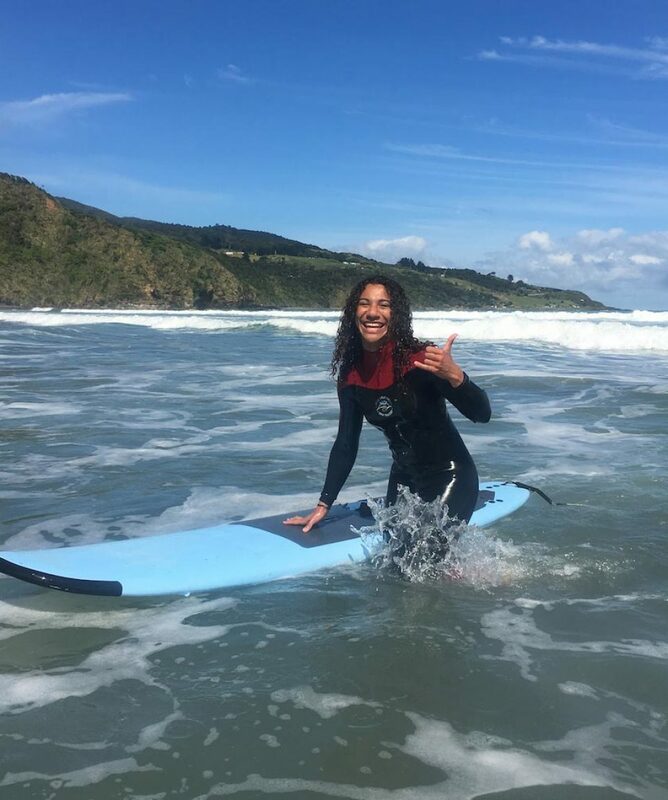 Karioi Lodge is a fantastic spot to enjoy Raglan activities with easy access to fishing, beaches, nature walks and of course our surf lessons. BUS: Catch the intercity bus to Hamilton and then get the Busit Route 23 connection bus to Raglan. We’ll pick you up from outside the library. STRAY BUS: No worries, your bus will pull right into our camp. Raglan will be one of your stops, so you can jump off the Stray Bus, do your Surf & Stay and then jump back on in a couple of days and continue your trip. SELF DRIVE: We are 2.5 hours from Auckland (drive south to Ngaruawahia, turn right at the BP station and follow the signs) and 45 minutes from Hamilton (take State Highway 23). Enjoy a morning surf lesson then take advantage of your free transfer into Raglan town to explore and get supplies. There is a kitchen at the lodge to make whatever you like (meals are not included). Enjoy all the other activities around the lodge like the sauna, pool table and lookout over the surf. Explore the area with activities including glow worm viewing, the loop track walk, Mt Karioi hike, Bridal Veil falls or hang out on the beach. Chill out at night or party in ’The Barn’ with your new friends. 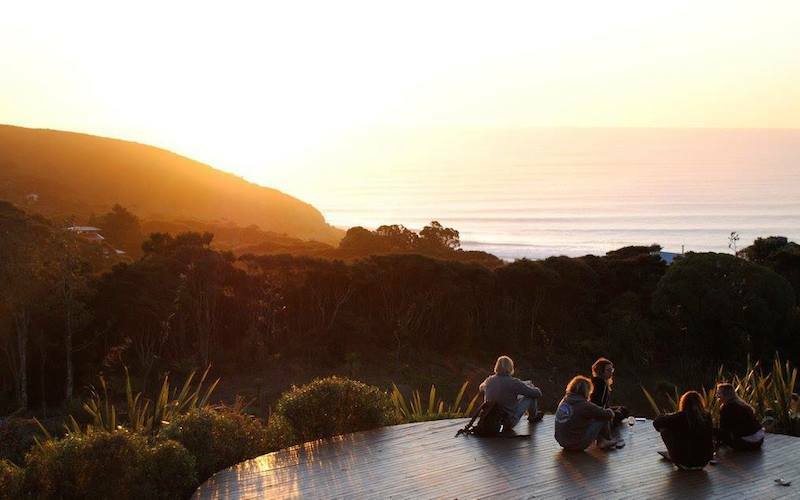 Our Mojosurf Camp Raglan is located in a surf lodge in Whale Bay on a 110-acre native reserve, about 10 minutes from Raglan township. Enjoy a morning surf lesson in Raglan then take advantage of your free transfer into Raglan town to explore and get supplies. There is a kitchen at the lodge to make whatever you like (meals are not included). Mojosurf Surf Camp Raglan is the perfect place to base yourself if you want to learn to surf or progress your surfing on consistent waves. Chill out in the awesome surf lodge, making new friends and relaxing in the sauna, while watching the famous surf break.